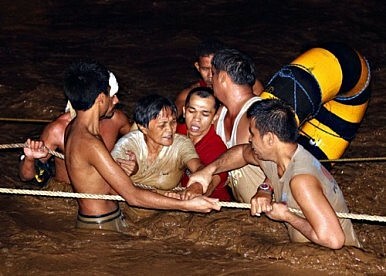 The subdued local coverage of typhoon Sendong raises new questions the media suffers from a Luzon bias. There’s no question that the situation in Mindanao, in the Philippines, is looking grave in the aftermath of typhoon Sendong. And with hundreds of casualties, and significant damage to property and infrastructure, it’s not surprising that local governments in the region are feeling overwhelmed. But while NGOs, civil society groups, schools, universities and individual citizens are contributing to relief operations, it’s hard not to notice that compared with when the main island of Luzon, and the capital Manila, has been devastated by natural disasters, the media has been comparatively subdued. When Luzon was hit by typhoons Ondoy and Milenyo, normal TV programming was changed to accommodate special reports and other coverage by the big media outfits based in Manila. Even print media joined in with the sensationalizing, underscoring the point that when disaster strikes Luzon, the whole country has to pay attention. In contrast, most of the appeals for donations now circulating among social networking sites following the disaster in Mindanao are citing news articles from foreign news organizations rather than local outfits. All this reinforces the idea of an “Imperial Manila,” where Luzon is lavished with extra attention not just from the media, but also from government and even the church. In contrast, residents of the southern provinces are too often left with the impression that they just aren’t as important as those living in Luzon. There’s an old saying that it’s only when things are at their worst that you find out who your true friends are. How the national government, NGOs, the church, civil society groups and the media in Luzon respond to Mindanao’s cry for help will therefore be a measure of how sincere these groups are when they say that we are one country, and that no one will get left behind. Another sign of how “Imperial Manila” views the rest of the country will of course come with how it tackles the ongoing peace talks with Moro rebels in the south. But first, Mindanao will have to grapple with the aftermath of this latest natural disaster – with or without the full attention of the main island. Japan-Philippines Defense Cooperation in Focus with Ministerial MeetingUS-Vietnam Relations in the Headlines with First Indo-Pacific Commander VisitIt’s Time to Rethink Philippine Policies on ChinaMalaysia’s Evolving Approach to China’s Belt and Road InitiativeWhat Will Indonesia’s Foreign Policy in Jokowi’s Second Term Look Like?